Trying to decide where to go on your next family vacation? If you’re looking to soak up the sun, dine on tasty cuisine and get away from the everyday…Puerto Rico is for you! I embarked on a mommy-daughter Puerto Rico vacation a few years ago and I’d love to return with my whole family to explore the islands further. Check out these six reasons to visit Puerto Rico with kids. 1. You’ll go bananas for local flavors. 2. Water activities abound in Puerto Rico with kids. 3. Visit the only tropical rainforest in the U.S. National Forest system. 4. No passports or foreign money are required. 5. Old San Juan feels worlds away. 6. History buffs get their fix at the San Juan National Historic Site. Need more reasons to visit Puerto Rico with kids? Puerto Rican cuisine incorporates flavors from Spain, Africa, the Caribbean and America to create dishes to tempt your family’s palate. Expect local ingredients like papaya, seafood, cacao, and my favorite, plantains. Sister fruit to bananas, green plantains are sliced and fried to be served as appetizer tostones. 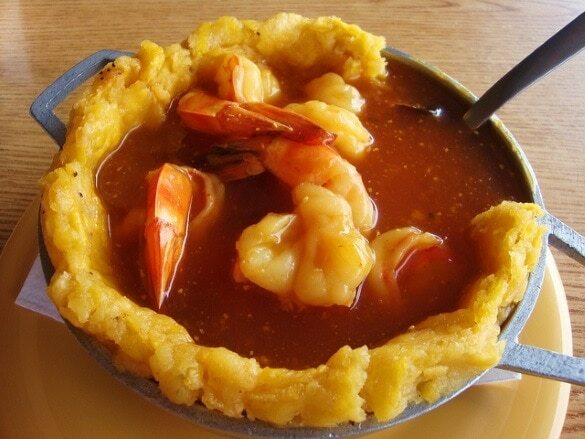 Or, they’re mashed and served with sauce and meat as the main dish, mofongo. Satisfy your sweet tooth with ripened plantains caramelized and served as dessert. Adults can wash it all down with Puerto Rico’s national drink, rum—served in a variety of shades with local fruit juices. Kids should be on the lookout for brightly colored carts peddling piraguas. These refreshing treats are made from ice shaved by hand and topped with sweet syrups in flavors like tamarind, coconut, guava and more. 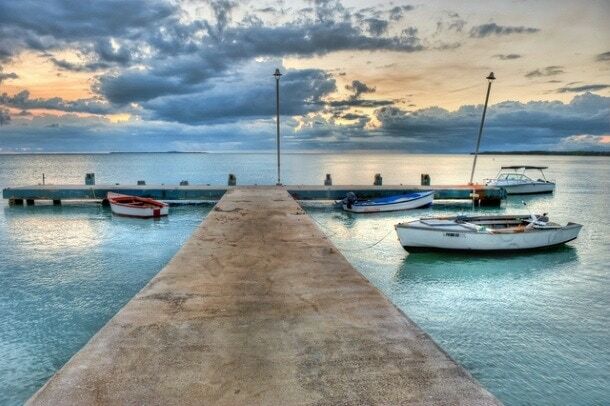 With over 270 miles of coastline, you’ll find lots to do in and along the waters of Puerto Rico. Beach bums can laze about on sandy beaches. Meanwhile more active travelers will want to dive into the water for swimming, snorkeling, scuba diving, and surfing. Windy weather along the northwest coast makes for excellent sailing, wind surfing, and kite surfing. For a seemingly magical experience visit the archipelago’s bioluminescent bays. These deep lagoons glow with delicate dinoflagellates, oceanic plankton that give off light collected during the day when viewed at night. 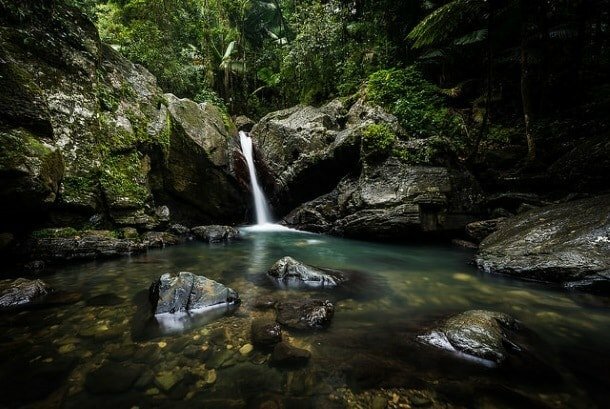 Nature lovers will want to visit El Yunque, the only tropical rainforest in the U.S. National Forest system. Here you can hike trails, enjoy a picnic, swim in river pools, and take in views of both the Atlantic Ocean and the Caribbean Sea. Puerto Rico is the easiest way to experience a different culture for American visitors. Puerto Rico feels worlds away, but since it’s a United States territory, passports are not required for U.S. citizens. Don’t worry about foreign money and exchange rates, either. The U.S. dollar is the standard currency on the islands. English is one of the official languages in Puerto Rico, making communicating easy. Since Spanish is the other official language, feel free to practice your Espanol during your visit. 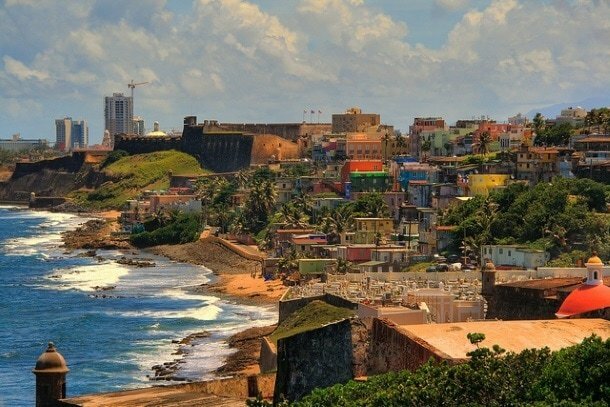 Spanish settlers built town of Old San Juan, or Viejo San Juan. Its cobblestone streets and colonial architecture feel very European. Meanwhile the vibrant pastel colors of the businesses and homes have a definite Caribbean vibe. The influence of Puerto Rico’s native peoples influence the area. Look for bright handicrafts in stores and music of all sorts being played by street musicians. If visiting Puerto Rico with kids on a Saturday or Sunday, be sure to hit up a local farmers market to soak up the sights, scents and flavors of Puerto Rico. 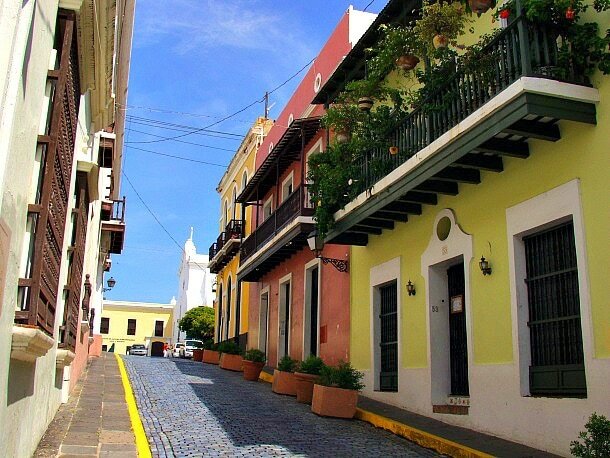 Discovered during Christopher Columbus’s second sailing to the New World, Puerto Rico is rich with history. For over 250 years Puerto Rico acted as the gateway to the Caribbean. Spain built the impressive fortress, Castillo San Felipe del Morro to ward off European attacks by sea. Known as El Morro, this site remains a popular destination in San Juan. Puerto Rico and Cuba remained the final two Spanish settlements following the Spanish-American War. Originally inhabited by Taino American Indians, the islands were ruled by Spain from 1493 to 1898, when the U.S. took over military control of Puerto Rico. Today El Morro and the lesser known Castillo San Cristóbal (which was built to thwart land attacks) are part of the San Juan National Historic Site. It’s run by the U.S. National Park Service. Take a self-guided tour back in time with a park-provided map and exhibit postings. Or, join a park ranger every hour on the hour for a 15 to 20 minute tour to learn an overview of the fortifications. When visiting Puerto Rico with kids, keep them interested in visiting these historical sites by purchasing a colorful kite in Old San Juan beforehand. 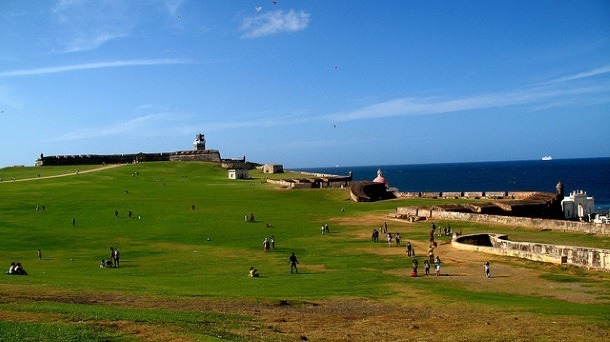 The winds and sweeping grassy fields at El Morro are ideal for kite flying and can serve as incentive to complete the tour whine-free. Puerto Rico is filled with world-class attractions that will turn any trip into a five-star vacation. Need an extra nudge to book your trip to Puerto Rico? Check out this video that was created in a partnership between Puerto Rico Tourism and Trip Advisor, highlighting real traveler reviews into a short video. Read more about Puerto Rico, check out Puerto Rico’s most popular hotels, and book your Puerto Rican vacation now on TripAdvisor! 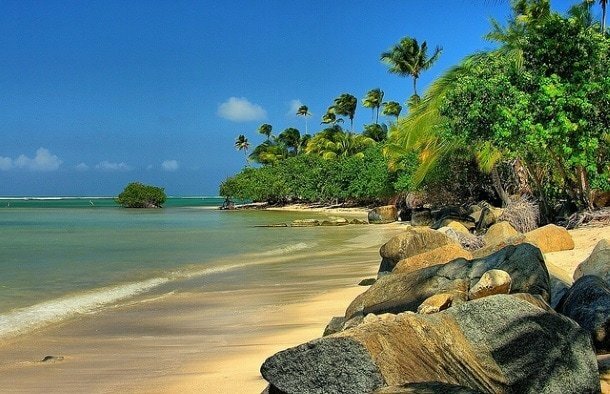 Live your own five-star vacation story in Puerto Rico. To learn more follow @PRTourismCo on Twitter, like SeePuertoRico.com on Facebook or visit SeePuertoRico.com. Why would you like to visit Puerto Rico with kids? Let us know in the comments below! Puerto Rico is colorful and have a really good vibe. There is so much to do there!